Architects have long operated based on the assumption that a building is 'complete' once construction has finished. Striving to create a perfect building, they wish for it to stay in its original state indefinitely, viewing any subsequent alterations as unintended effects or the results of degeneration. The ideal is for a piece of architecture to remain permanently perfect and complete. This contrasts sharply with reality where changes take place as people move in, requirements change, events happen, and building materials are subject to wear and tear. Rumiko Handa argues it is time to correct this imbalance. 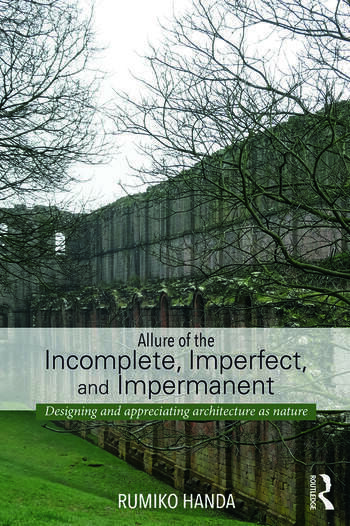 Using examples ranging from the Roman Coliseum to Japanese tea rooms, she draws attention to an area that is usually ignored: the allure of incomplete, imperfect and impermanent architecture. By focusing on what happens to buildings after they are ‘complete’, she shows that the ‘afterlife’ is in fact the very ‘life’ of a building. However, the book goes beyond theoretical debate. Addressing professionals as well as architecture students and educators, it persuades architects of the necessity to anticipate possible future changes and to incorporate these into their original designs. Rumiko Handa is Professor of Architecture at the University of Nebraska-Lincoln, USA. She holds a Ph.D. in Architectural Theory from the University of Pennsylvania and a B.Arch. from the University of Tokyo. Her writings have appeared in: Interiors: Design, Architecture, Culture; The Journal of the Society of Architectural Historians; Preservation Education & Research; The Papers of the Bibliographical Society of America; Design Studies, etc. She co-edited Conjuring the Real: The Role of Architecture in Eighteenth- and Nineteenth-Century Fiction.